The iPhone On T-Mobile: Why Not? AT&T's exclusive hold on the iPhone is coming to an end, and speculation is bubbling as to which U.S. carrier will get Apple's smartphone next. Verizon has been hot tipped to take over the iPhone, but the latest iPhone-trashing campaign for the Motorola Droid could mean it's not going to happen. 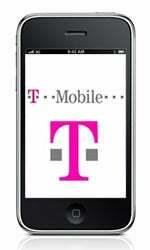 Now, a new carrier has emerged as a possible contender: T-Mobile. Yes, T-Mobile. Analyst Dough Reid tells The Street that he sees T-Mobile as a potential home for the iPhone. Like AT&T, T-Mobile is a GSM carrier, though T-Mobile is a much smaller company. Would users be willing to make the move to a smaller company? We may find out, according to Reid. Reid told The Street "Apple wants to move away from exclusivity; T-Mobile would achieve this for Apple in the U.S.," -- and it makes sense. Apple wouldn't have to manufacture a different iPhone to run on T-Mobile's network, as the GSM version of the iPhone that runs on AT&T would work. To offer the iPhone on Verizon's network, Apple would have to manufacture a new device. However, iPhone exclusivity on T-Mobile is doubtful. AT&T has around 71 million customers while T-Mobile has only half as many users. It would make sense for Apple to sell the iPhone on both AT&T and T-Mobile, rather than just pick one single carrier. Users dissatisfied with AT&T's network could just move to T-Mobile, as long as they are in the coverage area. And so, Apple wouldn't have to manufacture different iPhone hardware, which won't be of much use to sell outside the U.S. anyway, because of different network standards. The model for selling the iPhone on more than one carrier comes from outside the U.S. also. O2, now the largest carrier in the U.K., had the iPhone exclusivity until a month ago. Orange U.K. then sold 30,000 iPhones in the first weekend of carrying the device, and Vodafone will sell the iPhone starting January. In addition, T-Mobile UK and Orange are to merge, which will create the largest UK network, also carrying the iPhone. T-Mobile in Germany also sells the iPhone. With the foreign examples as a precedent, the multi-carrier iPhone model is out there. Whether Apple will bring home this model though, it is yet to be seen.